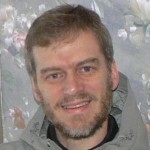 Yesterday, February 27, I posted a message from Gerald Neufeld. As it turns out, the Canadian Mennonite magazine recently published an article about Gerald and me, written by Amy Dueckman. 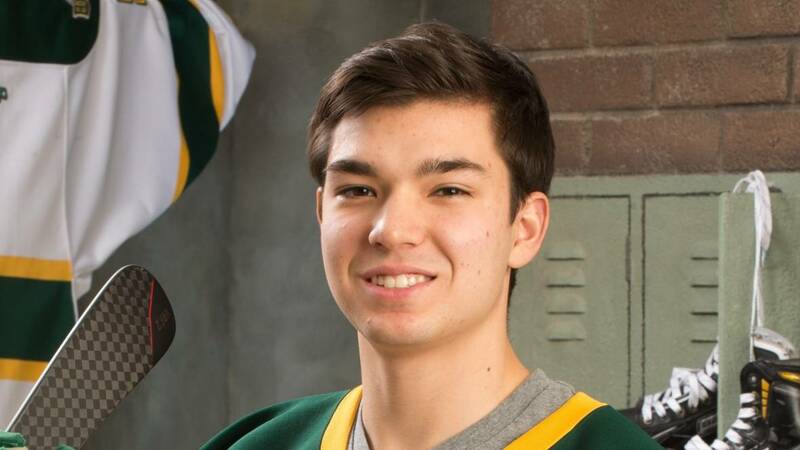 Gerald Neufeld of B.C. and Russ Sawatsky of Ontario have several things in common: they both served as missionaries in Japan, where they met their wives; and they both attended Canadian Mennonite Bible College in Winnipeg at the same time. But the donation of a kidney for one and the receiving of a kidney for the other gives the two a life-transforming connection like no other. Neufeld, pastor of Mennonite Japanese Christian Fellowship in Surrey, also serves part-time as music coordinator of Emmanuel Mennonite Church in Abbotsford. One Sunday morning in November 2012, his 12-string guitar was stolen from Emmanuel as he was preparing to lead a worship team. He shared the loss as a prayer concern at a Vancouver pastors’ meeting. In response, the pastor from First United Spanish Mennonite Church said he knew one of his members had a 12-string guitar he wasn’t using. The member offered Neufeld the guitar at no cost, and he gratefully received it. Another request that later came from the pastors group was that someone from the Spanish church needed a kidney transplant. Meanwhile, Sawatsky had been struggling for years with kidney failure and blogging about his journey (see kidneyforruss.wordpress.com). He went on medical disability leave when he began dialysis in 2014. If, like Gerald, you are interested in living organ donation, this link includes general information about both kidney and liver donations. You can also register as a deceased organ donor by following the links or the contact information on this site for the province or territory where you reside. This entry was posted in Uncategorized and tagged Abbotsford, altruism, Amy Dueckman, British Columbia, Canadian Mennonite, Canadian Mennonite Bible College, Canadian Mennonite University, Carol Penner, dialysis, Emmanuel Mennonite Church, ethics of organ donation, Gerald Neufeld, how do I donate an organ?, How do I save a life?, Japan, kidney disease, kidney donation, kidney for russ, kidneyforruss, Living Donor Paired Exchange, London ON, Mennonite Japanese Christian Fellowship, Ontario, organ donation, organs, Paired Kidney Donation, Religion and organ donation, Russ Sawatsky, Surrey BC, Winnipeg on February 28, 2017 by kidneyforruss. If you read the article I wrote in the Emmanuel newsletter you would have seen how I decided to donate. Rather than it being one huge step of faith, it really felt like a lot of little things, pieces of a puzzle that came together. As I reflect on this, I realize how much community has been woven through the whole process. In Paul’s letter to the churches of Galatia he tells them to “Bear one another’s burdens…” Here, he’s likely talking about helping people who are of bearing the burden that results from sin and the consequences of sin, but the burdens that we can help each other with could be anything that takes away from the joy in living our faith – sickness, difficulty finding work, struggles in relationships, uncertainty about the future… I’m not going to get into a lot more detail here but I thought this passage fits well with the role of the faith community in everyday life. A big part of bearing one another’s burdens involves prayer, and as I look back on my experience it’s interesting how the prayers and support of our faith community played such a major role. I read in the Canadian Mennonite magazine about another pastor who donated a kidney, and had no problems, so I decided to take another step and begin the donation process. I had to go through many tests in order to make sure I was healthy enough to donate. If any tests showed a danger of health problems in the future, I would not have been allowed to continue the process. It was at this point that I heard the one to whom I’d possibly donate a kidney, was from the same family that had given me a guitar several months earlier! When my 12-string guitar had been stolen I had put out a prayer request during one of the pastor’s meetings, hoping someone may know about a good deal on buying another guitar, and one pastor suggested he could check with a church member who has a 12-string guitar that was hardly ever used. Right away, I heard that I could have it. Now, this was the same family praying for a kidney! I had already pretty much decided to start the process to donate, but this helped confirm my decision. If they gave me a guitar, I guess I could give them a kidney! 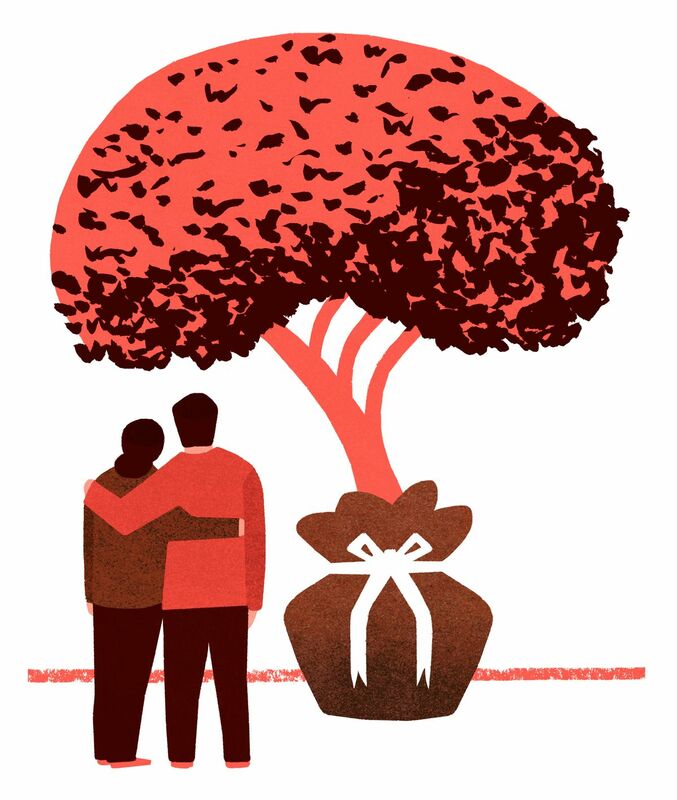 Since I wasn’t compatible with the person who needed the kidney, I joined a special program where other incompatible donors and recipients are matched. 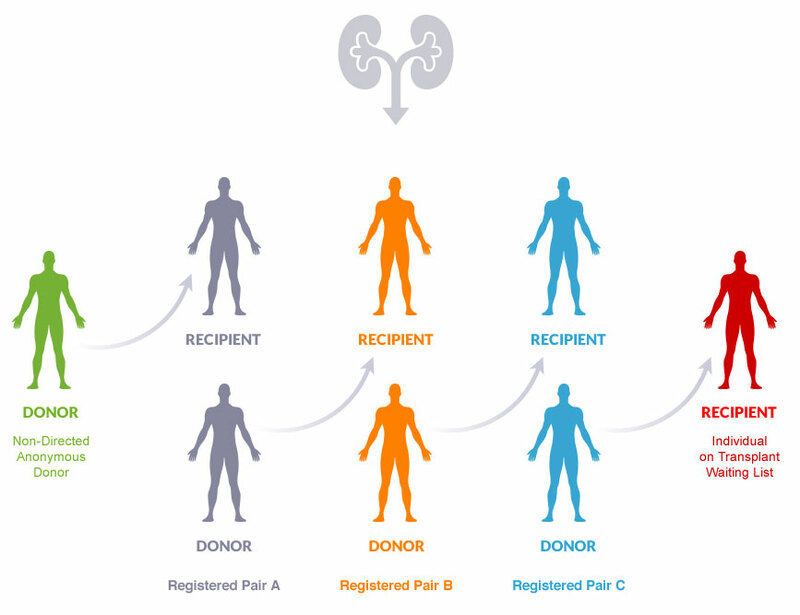 So, between 2, 3, or 4 incompatible pairs people could be matched so that each person can indirectly donate or receive. It usually takes several months, but before we were matched, the other person actually received a kidney from a deceased donor. I then wondered if God was saying, OK, you don’t have to donate anymore. But by that time, I had heard about a different friend who needed a kidney, so I decided to stay on the list in order to donate for him. Why not? I was all ready to donate! Russ Sawatsky is a friend I’d met in Japan. We’d both been mission workers there, and had met several times. Now, Russ is living with his family in Ontario… After much waiting, we were finally matched and we each had surgery. To have surgery, I wasn’t too scared because I felt that God had led me to this decision. Of course there was a potential that there may be some complication, but I felt that even if I ended up with some major problem, God would continue to lead me through. I sensed your prayers as well as the prayers of many others in my wider community of family and friends. Through this whole process, I didn’t let myself think too much about possible things that could go wrong (‘cause I didn’t want to chicken out!) (even though the chances of anything terrible happening were quite slim). I expected everything to go smoothly, but there were a few unexpected things that happened, reminding me that this was a complex process. I guess one thing is that the whole process took longer than I expected. When I first called the number of the “Pre-Assessment Transplant Clinic,” I gave them my email address, and they then sent me all the information I needed to get started in the process. I was thinking in my head that once I called that number, I was committing myself to donate, and would probably have surgery within a few weeks. It could have happened in a couple of months, but in the end, it was over a year later that everything finally worked out. During the process there were many opportunities for me to decide to opt out if I wanted. The staff were very careful to make sure I didn’t feel obligated to continue if I suddenly felt uncomfortable about the whole thing. After the surgery, I was a bit surprised that it was somewhat more challenging than I had expected. There was no time when I felt all that much pain. At home, though, I took the maximum recommended dosage of painkillers because I wanted to be able to sleep, but it had the opposite effect. My mind went into a panic and I was not able to sleep for over 30 hours! It was a strange feeling, and at times I thought I might die. I prayed quite a bit during that time, committing to God, but physically my mind could not stop racing. After that I didn’t take any more painkillers and I actually don’t think I needed them. I’m glad that the weird effects only lasted about a day, and I’m thankful for all your prayers during my recovery. It was quite meaningful for me to know that I am a part of a larger faith community. It wasn’t just my own prayers that gave me strength, as I’ve mentioned before. You have been participating as well. In the scripture passage read today, Paul not only encourages the people to bear one another’s burdens, he also says that everyone must carry their own loads. This might seem to be contradictory, but the meaning is different. We are to support and encourage each other along the way, but everyone must also take responsibility for their own actions. Someday, we’ll each have to give an account of how well we lived with what God has given us. The good news is that we are already children of God, part of God’s Kingdom through the sacrifice of Jesus Christ for us on the cross. Today’s passage from Galatians ends with the encouragement to do what is right, not giving up, and whenever we have the opportunity, to “work for the good of all, especially those of the family of faith.” We all have chances to take a step of faith in some area. It doesn’t have to be organ donation. Maybe God is calling you to commit to give a greater percentage of your money to help others. Or maybe you are being called to give of your time, or something else in a different area. It may be a bit scary, but if you take just a small step of faith, you will see what God can do! And the one step may lead to another and another! I actually did a lot of calculating before deciding to donate a kidney, but I’m trying to trust more and more in God’s leading so that I can take more steps in the direction I feel God leading, even if I haven’t calculated and weighed all the possibilities. Sometimes I end up waiting too long before taking a step of faith, but with the support and encouragement of believers around me I’m learning to trust our Lord, more and more. Our steps of faith may be wobbly like a baby learning to walk. We’ll sometimes fall, but like a loving parent, I believe God is pleased to see us keep trying. The great thing is that we are not alone in taking our steps. We are part of a faith community. How do we bear one another’s burdens? Here in Canada, we value independence. We teach kids to stand on their own, and take their own responsibility. We make sure we are doing the right thing, and it doesn’t matter so much how others are doing. But, when I lived in Japan I saw a different culture where the emphasis was much more on the community. The needs of the group take priority over individual needs. In Japan people are taught to think about the needs of others before their own. I sometimes notice this cultural difference between my wife and me. She’s criticised my driving because I’ve often failed to let others into my lane. My driving style is to mainly make sure I am following the rules, and others can do what they want, but in Japan people are taught to consider others, even when driving. I think we can learn something from them in this area. It’s so easy to go through life with blinders on (like a horse). Sometimes horses have blinders on each side of their head so they don’t get distracted and can focus straight ahead. Instead, I’m trying to take more notice of what’s happening around me. It’s not good to just focus on my own situation all the time. Is there some area where you’ve noticed a need? Maybe it’s time to step into the situation in order to offer help in bearing another’s burden, so to speak. All through the process of my experience, I’ve sensed the work of the wider faith community — after losing my guitar, in my request for prayer at the pastor’s meeting, the request for prayer when someone needed a kidney, the prayers and support from you as well as family and friends in other places, as I underwent surgery, the prayers and support as I took time off work. Community played a role as I learned through the Canadian Mennonite magazine about the other pastor who donated a kidney. And, my connection with Russ Sawatsky through mission work and the wider Mennonite community was another area where community played a role. It’s good to hear that Russ is now doing well, and also the person who directly received my kidney here in BC. I also feel pretty much back to normal. So, what about each of us, in our lives? Where might God be leading us to take a small step of faith? Jesus said we only need faith the size of a tiny mustard seed. The reason is, God recognizes our little attempts to be faithful, and brings us the rest of the way. Each of us are called to really just take a small step. It usually involves some risk. Maybe God is calling you to take a step. Many people have already signed a donor card. It can easily be done online, and even kids can sign up. A link is provided in the bulletin, but you can also just do a search for “BC Transplant.” Someone who has registered a decision to donate any organs needed, after death, could potentially save the lives of eight different people. Or, some of us may feel a calling to sometime become a live donor. Recently, I was amazed to hear that if you donate a part of your liver, it grows back! If I’d known that, maybe I should have done a liver donation rather than kidney! No… I have no regrets. Maybe someday I’ll consider the liver. But, one thing is becoming more and more clear to me. I think I may never have experienced donating a kidney if it hadn’t been for the supportive community and the encouragement I experienced in the small steps along the way. Almighty God, you have blessed us with so much! Thank-you for all you’ve given us. Thank-you that through your Son, Jesus we have perfect peace and joy. Thank-you for the gift of your church. Each day, you lead us, O Lord. Thank-you that no matter what happens around us we need not fear, because you walk with us. Help us to trust that you always provide us with everything we need to do your will. Increase our generosity, that we may rely more and more on you and less and less on ourselves. Grant us the courage to step out in faith. Help us to notice those areas where you call us to step in and help bear another’s burden. May we recognise the opportunities you give us to take those small steps of faith, through the power of Christ at work within us, Amen. This entry was posted in Uncategorized and tagged altruism, British Columbia, Culture and organ donation, ethics of organ donation, ethics of organ transplantation, how do I donate an organ?, How do I save a life?, kidney disease, kidney donation, kidney for russ, kidneyforruss, Living Donor Paired Exchange, Ontario, organ donation, organs, Paired Kidney Donation, Religion and organ donation, Russ Sawatsky, Vancouver on February 27, 2017 by kidneyforruss. 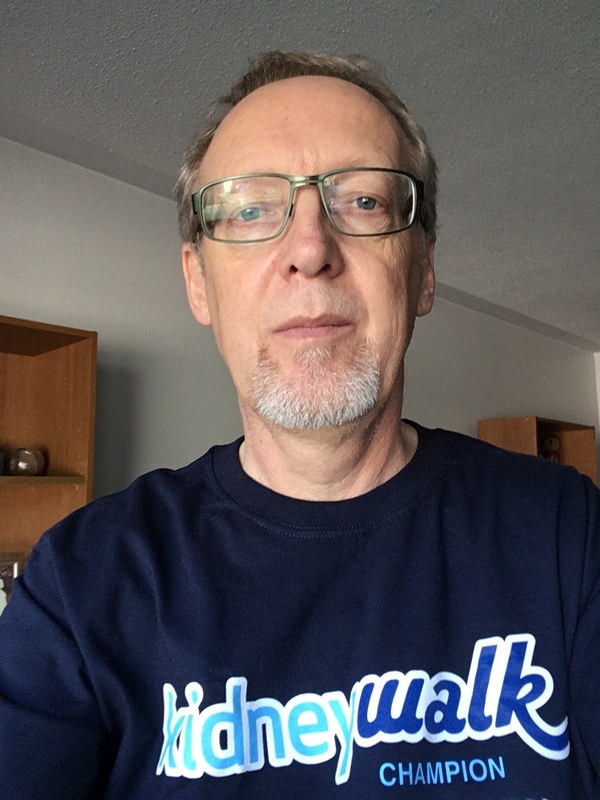 Two months ago, in September, Gerald Neufeld donated a kidney to a person in need in British Columbia, closing the loop on the Paired Kidney Donation program that we had entered into, he as a donor and me as a recipient. This is the first time I have mentioned Gerald’s name in any of my blog posts. The transplant coordinators generally want to keep these matters confidential for the first several weeks following the actual transplant. Sadly, sometimes if direct donors and recipients find out about each other, the altruistic nature of the donation can become a bit weird. But, enough time has passed that I have been released from this constraint. Gerald Neufeld, my donor in the Paired Kidney Donation program. Rie Neufeld, Gerald’s wife and among many other things, caregiver following Gerald’s kidney donation surgery. Before I go on, I want to mention once again another person in British Columbia, someone I had known for many years, who had also volunteered as a donor for the paired exchange program. Ultimately, I only need one kidney to thrive and therefore only one donor, and so this other friend did not become a donor. Nevertheless, I wish to thank him for his willingness, along with his wife for her support. The encouragement I received, the depth of emotion I felt whenever I spoke with him as he accompanied me on this journey across thousands of kilometres, will remain in my heart forever. Back to Gerald. Gerald’s connections with me and Etsuko are perhaps not quite as old, but they are every bit as significant in a different way. We shared some years together as former missionaries in Japan. As with me and Etsuko, Gerald also met his wife Rie on the other side of the Pacific. And although we didn’t have a whole lot to do with each other at the time, several years earlier we even spent a year together as fellow students at Canadian Mennonite Bible College (now Canadian Mennonite University) in Winnipeg. Who would have thought that so many years later (we returned from living in Japan a final time in 2000) we would establish a new life-transforming connection like we have experienced in 2016. In the caption below Rie’s picture, I mentioned that Rie was Gerald’s caregiver following his surgery. Although Gerald was discharged from the hospital in a timely manner, recovery is something that still takes a number of weeks before a return to work is possible. For that reason, Gerald received support from his employers, Emmanuel Mennonite Church in Abbotsford, BC, where he is music coordinator, and the Mennonite Japanese Christian Fellowship in Surrey, BC, where he serves as pastor. Thank you, Gerald and Rie, thanks to your three children, and thank you to your church communities for all that you have done, not just for me, but also for raising awareness of the need for organ donation. I will add a small note about my situation these days. Recovery from the blood clot in my right leg continues but I hope to have that fully resolved by December. Last week I went to the kidney clinic as I have been doing every two weeks for quite some time. After reviewing the results of my blood test, the nephrologist I saw that day pronounced me fit and said that he wanted to see me next in two months! And then he told me that he would have suggested three months except that he was concerned it would “freak (me) out.” It almost did. Wow. By then it will be just short of the six month anniversary since my transplant. I really am making progress. This past Friday, Etsuko and I went to Sarnia (about an hour west of London, ON) for an overnight stay at a hotel and a very pleasant walk along the waterfront. Friday was apparently the last nice day before winter began to settle in, but one of the main reasons we went away on this little trip was because we had to burn up some Air Miles before they expired at the end of this year (yes, we are among the many Canadians forced to use our points whether we want to or not). It turned out to be a great day, and it was my first time away from home in two years without having to haul along a bunch of equipment and supplies for dialysis. What a sense of liberation that was. So, lots of reasons to be thankful! But today I want to say I am mostly grateful for people like Gerald, people willing to be living donors, as well as those who support them. Not everyone is willing to be a living donor, or even if willing, able to take such a step because of health limitations, but today you can register as an organ and tissue donor following your death. Here is the URL that provides links to all of the provincial and territorial donor registration sites: Canadian Transplant Society. Please register and make a difference. Thank you. This entry was posted in Uncategorized and tagged Abbotsford BC, altruism, British Columbia, Canadian Blood Services, Christianity, dialysis, ethics of organ donation, ethics of organ transplantation, how do I donate an organ?, How do I save a life?, kidney disease, kidney donation, kidney for russ, kidneyforruss, Living Donor Paired Exchange, London ON, Ontario, organ donation, organs, Paired Kidney Donation, Sarnia ON, Surrey BC on November 21, 2016 by kidneyforruss. 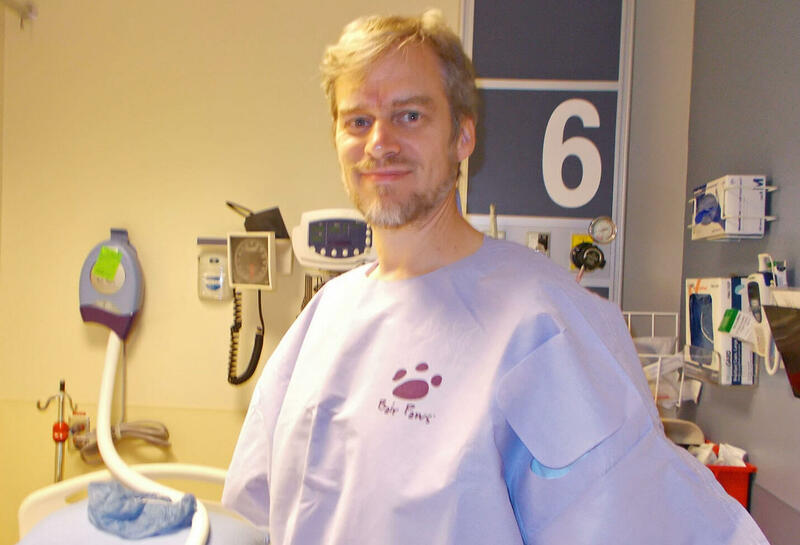 On Friday, July 29, I received a transplanted kidney from a living donor. The surgeon who performed the surgery was Dr. Alp Sener, urologist at the University Hospital, London Health Sciences Centre, London, Ontario. My new kidney immediately began producing urine so Dr. Sener removed the catheter that had placed in my belly for peritoneal dialysis two years earlier. Yay! No additional surgery required. My surgery did not begin until 2 pm, even though I had to be in the hospital at 5:45 am that morning. The medical staff needed to know that I was not ill so that they could go ahead with the removal of the kidney from the donor. It made for a long wait for me, and for my wife, Etsuko, and four children, Rika, Keila, Aisha and Aaron, and for two people from Valleyview Mennonite Church, Alvin M. and Erma K.
The last thing I remember in the operating room before the surgery was that there was a mask placed over my face and I was told to breathe deeply to take in lots of oxygen. Eventually, they must have introduced an anesthetic, because shortly after… I was awake in the Transplant Unit. The four hours of surgery and two hours in the post-surgery recovery area took no time at all by my reckoning. Since then, one of my main accompaniments has been pain. Having one’s belly cut into is not a minor event. I didn’t sleep much that first night; I know that because a nurse came in and checked me out every hour. Not surprisingly, given we are dealing with a kidney, is that they wanted to see how much urine I was producing. It looked a lot like cranberry juice during those first days. I’ve been told that one of the keys to a quick recovery is to get the patient moving. So, the next day, I was helped to sit up and make my way to the chair in my room a mere two steps away. It seemed like an almost impossible accomplishment. Then they brought in a scale and I had to stand up and step onto that device. For a guy who had been walking 8-10 kilometres almost every day for the last few years, these small actions seemed like quite a comedown, and yet they were as strenuous as anything I had faced in a long time. From there I graduated over the next few days to a 20 metre jaunt and eventually multiple laps around the unit. A transplanted kidney likes to be “wet.” Completely contrary to my time on dialysis, then, instead of moderating my fluid intake, I was told to drink a lot, at least two litres of water per day, and on top of that, they were pumping fluids into me via IV throughout the first few days of my stay. When I woke up one morning, I was puffy from top to bottom, including my eyelids. Not a pleasant feeling. I had also gained 10 kilos of water weight. I’m pleased to say that excess water is almost all gone now, though, which makes for a much more comfortable body. I’m so grateful for all the visitors, several people from church as well as neighbours. I can’t say enough about the importance of that kind of support. 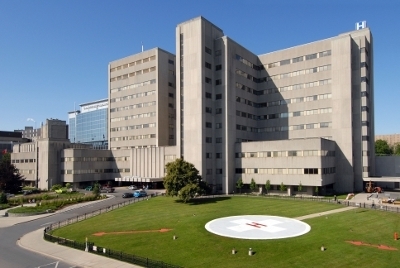 On top of that, we are so fortunate to be living nearby the hospital so that visits from my wife and my two London-based children were a possibility. 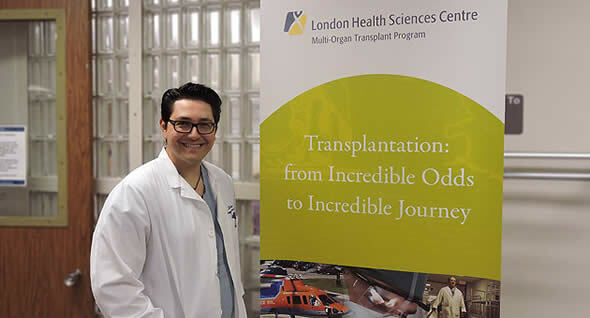 Transplant patients in London come from all over Ontario, which makes that kind of support more of a challenge for those who come from farther away. Our public health care system is often criticized, but I have to say that my experience has been better than anything I could have expected. The care of the nurses, the twinkle in the eyes of the doctors when they came in day after day, telling me that my new kidney is functioning so very well, the staff who organized this wonderful thing called Paired Kidney Donation. As I heal, I know that I am going to be freer and healthier than I have been in decades. What other response can there be than gratitude? One diagram showing how an undesignated donor can make a difference in many lives. 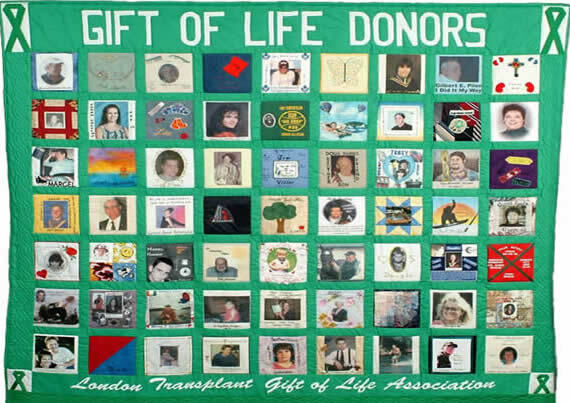 A quilt of donors hanging in front of the Transplant Unit, showing both living and deceased donors. This entry was posted in Uncategorized and tagged altruism, British Columbia, Culture and organ donation, dialysis, how do I donate an organ?, How do I save a life?, kidney disease, kidney donation, kidney for russ, kidneyforruss, Living Donor Paired Exchange, London Health Sciences Centre, London ON, Ontario, organ donation, organs, Paired Kidney Donation, peritoneal dialysis, Russ Sawatsky, University Hospital, Valleyview Mennonite Church on August 10, 2016 by kidneyforruss.